The arrival of the third egg came in the early hours of the morning our time. By the time I woke up and got to my computer, someone on Facebook had told us there is a third egg. For the past four years now, Pot Plant Owl has only laid three eggs, so this should be it now. Spotted Eagle Owls can lay up to four eggs but it depends on the availability of a good supply of food. 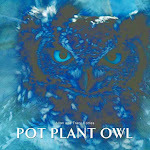 Judging by the 'well-rounded' figure that Pot Plant Owl has got at the moment, there is a chance that she may lay a fourth egg. I will be chatting on the Ustream chat site as soon as the stream and chat are snychronised.